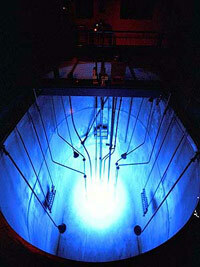 The Reed Research Reactor was established in 1968 and is the only reactor operated primarily by undergraduates. This section details its history, uses, and capabilities. There are currently approximately 40 students licensed to operate the Reed reactor. In addition to operating the reactor, many students serve as senior staff and in supervisory positions. If you are interested in bringing a class of students or another group to visit the reactor, please read this section. Much of the work performed at the Reed reactor is in collaboration with external research groups. If you are interested in using the Reed reactor for a project, this section is for you. We offer a 40-hour Radiation Safety Officer (RSO) Class. The next class will be June 18-22, 2018. We are certified by the State of Oregon to perform radiation meter calibrations. Does the reactor make electricity? What happens to the radioactive waste? Can the reactor meltdown? Answers to these questions and more are here. What does the reactor look like at full power? We are dependent on incoming freshmen who want to run the reactor. There are no prerequisites to taking the seminar. An orientation meeting is held during the second week of Fall Semester. Check the posters/flyers for specific information. The seminar is in addition to your regular class load. The seminar meets two nights every week. On Monday's at 7:30 pm there is a group seminar in lecture/discussion format. On Wednesdays and Thursdays labs meet to apply the skills necessary to operate the reactor. There are homework assignments and check offs requirements in addition to the class time and labs. The seminar runs September through the first week of December. In late October, 15 students are selected to continue the program in January to get ready for the NRC exam in May. We come back two weeks BEFORE classes start in the Spring for two weeks of maintenance and work. That will be on January 11, 2016. The seminar then starts again in the same format (Monday and Wednesday/Thursday) until the end of April. Then the NRC exams consist of a three hour written exam and a four hour operational exam scheduled during Spring Break. All this information will be publicized during orientation week and the first week of classes. If you somehow miss the notices, feel free to email or call after classes start.